Government continued relief work, inclusive of holding medical camps and ministers distributing assistance. Tamil Nadu’s Opposition parties on friday joined hands in seeking a probe over release of surplus waters from Chembarambakkam reservoir, with DMK chief Karunanidhi submitting a memorandum to Governor K Rosaiah, seeking an inquiry by a sitting High Court judge into the issue. Even as the state continued its relief work, Karunanidhi alleged that the devastating floods in Chennai was caused by the “neglectful, anti-people administration of the Jayalalithaa headed Tamil Nadu government”, resulting in the death of innocent people and damage to property. The crux of the opposition charge and also in a section of media, is that in the last week of November when Chennai witnessed moderate showers, the discharge volume from Chembarambakkam reservoir was trammeled. After the heavy rainfall on December 1, a huge volume of surplus water — approximately 29,000 cusecs in a short span of time was let out, resulting in heavy flooding in Chennai. Against this backdrop, Karunanidhi alleged that the Public Works Department did not take any “precautionary steps” for staggered release of water in advance, despite forecast of heavy rains and experts’ caution over the dam’s capacity. 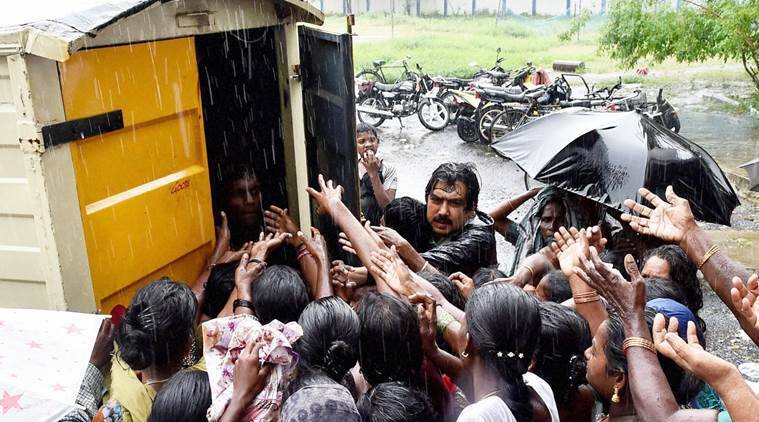 The DMK chief also wanted the inquiry commission to fix responsibility for the alleged delayed opening of the dam and determine compensation for the flood-hit people. Later, speaking to reporters, he said Governor had informed him that he would take appropriate action after going into the memorandum. Other opposition parties like Congress, MDMK, CPI(M), CPI and Viduthalai Chiruthaigal Katchi have also backed the demand. “A commission of Inquiry, headed by a sitting High Court Judge must be constituted to go into the discharge of flood waters from Chembarambakkam reservoir,” a joint statement by People’s Welfare Front leaders like Vaiko, G Ramakrishnan (CPI-M), R Mutharasan (CPI) and Thol Thirumavalavan (VCK) said. Congress Tamil Nadu unit president, E V K S Elangovan said the reservoir should have been opened in advance and as it was not done, it resulted in Chennai’s flooding. BJP Tamil Nadu State chief Tamilisai Soundararajan said it would be good if the government clarified the issue. Meanwhile, government continued relief work, inclusive of holding medical camps and ministers distributing assistance. A release from the office of Minister of State Pon Radhakrishnan said toll plazas in Tamil Nadu will not charge fee for one more week till Dec 18 following his representation to Prime Minister Narendra Modi. The Coast Guard said it was continuing relief work in waterlogged areas here and in Cuddalore for the 10th consecutive day. “Seven teams of coast Guard were deployed along with two ambulances and four trucks with relief material,” it said, detailing locations of relief work.